How to characterise multi-layer films with sub-micron infrared spectroscopy. 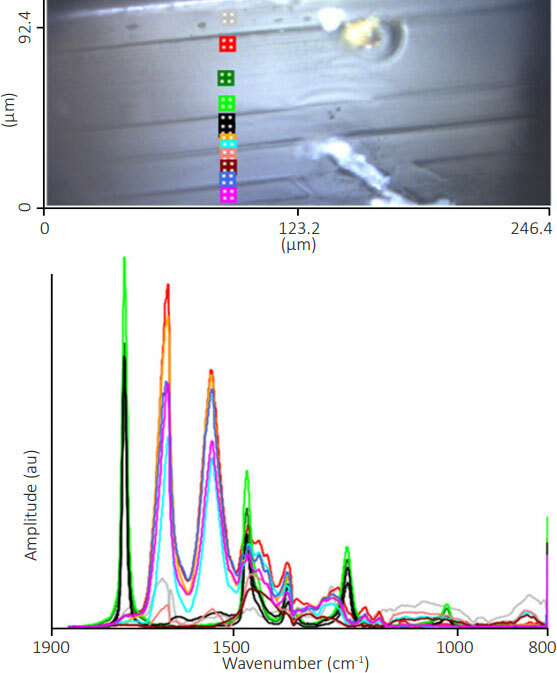 O-PTIR is a breakthrough technique that makes it easy to measure films that were previously difficult to analyse due to spatial resolution limits. Blue Scientific is the official distributor for Photothermal Spectroscopy Corp in the UK, Ireland and Nordic region (Norway, Finland, Sweden, Iceland, Denmark). For more information or quotes, please get in touch. FTIR (Fourier-transform infrared spectroscopy) is commonly used to analyse thin films and multilayer materials. 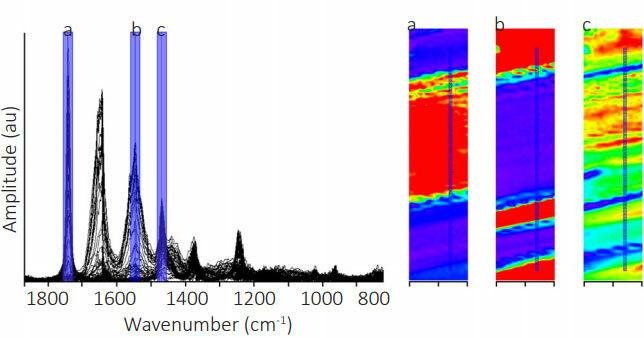 However, as layers become increasingly thinner (for example in packaging materials, especially in the food industry), the spatial resolution of FTIR is often insufficient. What is Optical Photothermal IR Spectroscopy? 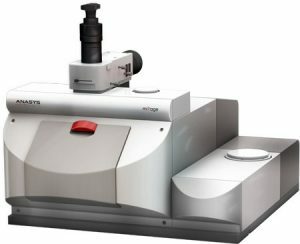 O-PTIR overcomes the IR diffraction limit by combining a mid-IR pulsed tunable laser with a colinear visible probe beam. When the IR laser is tuned to a wavelength that causes a molecular vibration in the sample, there is absorption. The photothermal response from the sample is then measured via the change in reflection during absorption. O-PTIR is the result of over a decade of research into photothermal physics, initially developed via AFM-based nanoscale IR spectroscopy by Anasys Instruments and their collaborators. 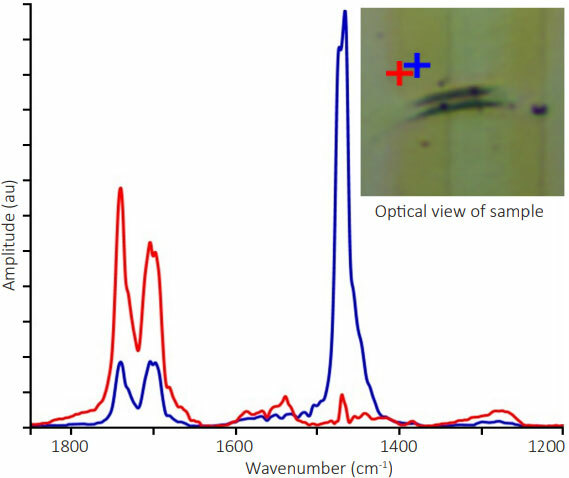 Food packaging film: Optical image and O-PTIR spectra. The spectra are from points 0.5 µm apart, and show different materials in the film. O-PTIR delivers high quality spectra in a non-contact reflection mode for a whole variety of sample types. Data quality is consistent with transmission FTIR. 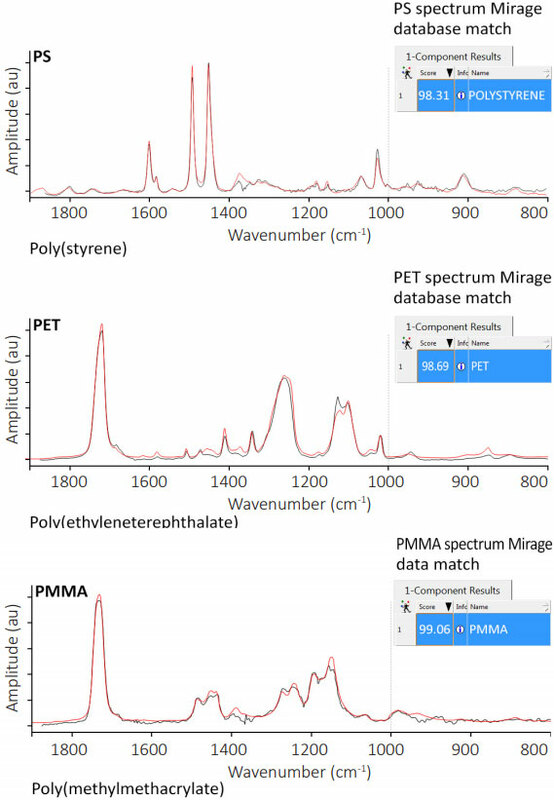 For example, the O-PTIR spectra below of polystyrene (PS), polyethylene terephthalate (PET) and polymethyl methacrylate (PMMA) have over 98% match rates with the KnowItAll spectroscopy database. Measurements were taken in reflection modes on samples over 20 μm thick. Even the strongest bands exhibit no evidence of saturation. Only the top few microns on the surface are measured. This depth is comparable to ATR (Attenuated Total Reflection), but without the problem of optical band-shape distortion. O-PTIR spectra (black) compared to the KnowItAll database (red). Top to bottom: Polystyrene, polyethylene terephthalate and polymethyl methacrylate. >98% match for all spectra. Conventional transmission mid-IR spectroscopy is not usually suitable for thick samples. Light is completely absorbed or scattered before passing through the sample, so the detector does not receive enough photon energy. O-PTIR however is a non-contact reflection-based technique. This it can be used on thick materials, so there’s no need to produce thin samples. This makes sample preparation much simpler and speeds up the whole process. The example below shows a reverse engineered multi-layer film, prepared as a simple block face. Points were selected from the optical image, and data took only seconds to acquire. Multilayer packaging film block face sample. Points were selected manually and the data was collected in seconds. The spectra show the varying composition of each layer. Multilayer film (7 layers) from food packaging, identifying layers with high concentrations of ester groups, polyamides and polyethylene chains. Carbonyl band at 1730 cm-1, amide II band at 1541 cm-1 and CH bending band at 1470 cm-1. 20 x 85 µm hyperspectral image with 1 µm pixel size.